VOCAL’s AoIP Gateway Reference Design interfaces analog audio connections for intercom and radio systems with IP networks using VoIP protocols. 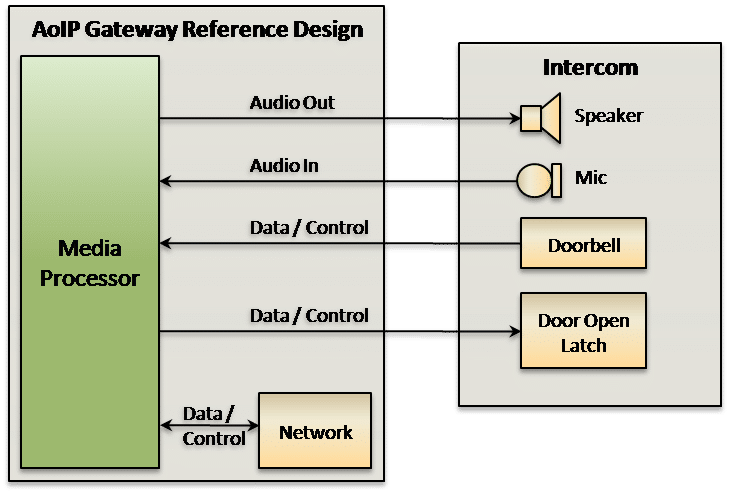 VOCAL’s AoIP Gateway reference design is available for licensing as a turn-key product or as software and hardware engineering designs for your application development. Our Reference Designs far surpass the competition in terms of cost advantage and time-to-market potential, achieving scalable channel density while supporting rapid integration of new features and modules. Customized interfaces for radio operational controls are also available. Contact us for a demo or to discuss your specific application and performance requirements. We have over 25 years of custom design and development experience in the telecommunications industry; our expertise and extensive customization support will result in the product you want at an unbeatable cost. Since VOCAL provides both the hardware design and a complete, optimized software solution, the result is a fully integrated, robust product which can be brought to market quickly. VOCAL’s AoIP Gateway converts between legacy bi-directional or broadcast audio applications and IP networks using a VoIP connection and SIP or RTSP. Our AoIP Gateway converts voice media between any analog device (two-way intercom, public address and radio systems) and a VoIP connection. The AoIP Gateway could be used at both ends of a link for conversion to IP transport media. Alternatively, the AoIP Gateway could be used to bridge what use to be dissimilar worlds. As an example, a PTT radio network could appear as a SIP end-point registered as an extension to your Cisco or Asterisk switch. The compliance of our telephony software to industry standards has been consistently demonstrated over the course of many years of software and hardware development and testing. Over 10 million ports of VOCAL products have been shipped by our customers using VOCAL’s voice processing, data and facsimile modulations, data protocols, facsimile command sets, and network protocol stacks. Many high-density server systems have been developed using VOCAL software, each meeting extensive interoperability standards. Our VoIP software suite works seamlessly with popular industrial servers such as those available from Cisco, Quintum, NetCentrex, and Asterisk. VOCAL has conducted exhaustive compatibility and interoperability testing using many VoIP providers. Device configuration can be completely managed using the web interface built into the firmware or restricted as desired by the licensee. For further information regarding compatibility and interoperability testing, please contact us.